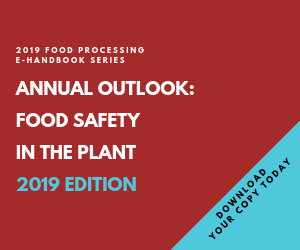 Industry and global retailing consensus has made the Safe Quality Foods (SQF) Initiative to be the U.S. standard plants must follow. Launched in 1994 by the Food Marketing Institute, the initiative and its attendant SQF Institute (www.sqfi.com) is the only such program outside of Europe recognized by the Global Food Safety Initiative (GFSI), itself administered by CIES - The Food Business Forum (CIES stood for Comité International d’Entreprises à Succursales, or roughly International Committee of Food Retail Chains (www.ciesnet.com). Walmart announced in early 2008 it was the first nationwide U.S. grocery chain to require its food suppliers to become certified against SQF or one of the international food safety programs recognized by European-based CIES. At the time, Walmart said it required suppliers to complete initial certifications by December 2008 and be fully certified to third-party audits by July 2009. Although there are reports the industry is behind schedule, at some point this standard will be a fait accompli.